This summer has been a time chock full of growth and incredible learning. At the start of the summer my prayer was for the Lord to stretch me personally. I came into this summer not knowing what was going to happen or how I was going to survive this completely new experience. He definitely has answered my prayer in big ways and I have grown closer to the Lord exponentially more than I previously thought was possible. God began to answer my prayers starting with the first week of campers, but I only realized this after the camp ended. Not only was this my first taste of this completely new experience, but I was leading the youngest age group. No matter what I did throughout the week, my campers seemed distracted. I was working so hard trying to get these kids to understand how much God loves them. I was stressed, discouraged, and absolutely exhausted. I felt like nothing I did was going to help my campers understand the Gospel. I kept trying to impact these kids’ lives for Christ and then became frustrated when there was no positive response. Throughout Kids Camp A there were many different and hard situations that happened with my campers. Dealing with these situations was something that was completely new to me. Every waking moment I was wondering what was going to go wrong. I went through this week of camp absolutely empty, frustrated, and wondering what the Lord was trying to teach me through this insane experience. On the last night, our speaker was giving an invitation and the counselors went to the back of Lakeview. I remember looking down the aisle and seeing one of my campers. 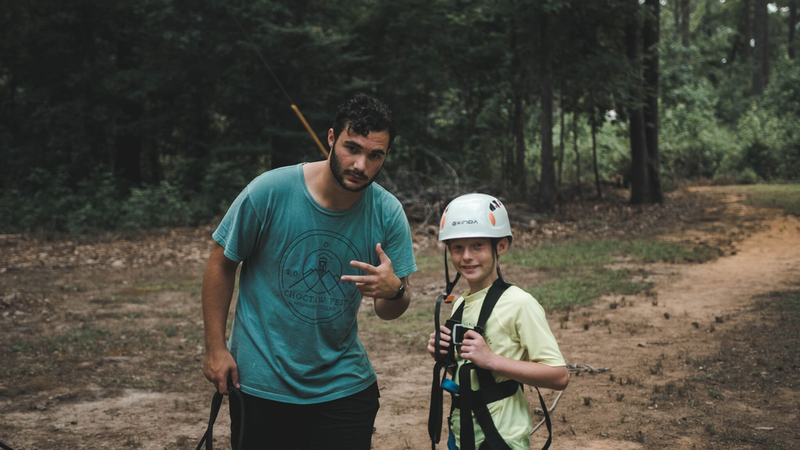 I spent a lot of personal time encouraging this camper, and it was frustrating when there was absolutely no movement or interest in the Gospel. When I sat down to talk to the camper, there was an overwhelming feeling of relief that came from nothing but God. In talking to this camper through salvation, God began to speak to me. He told me that I had been focusing my entire week on what I could do in my own strength rather than what God could do in His awesome power. He told me that I needed to let the Holy Spirit work in the lives of these campers and that I should not worry about things that only He can control. God answered my prayer through an absolutely crazy first week of camp. Even though Kids Camp A was the most stressful week that I have experienced, seeing God at work in huge ways made every second worth it.